Purchased for a KTM 1190 adventure R. Solid product, large platform, looks great. Purchased the black anodized, finish was spot on, and blends with the bike well. I have come to love the tapered front profile of the peg surface, I find this allows a comfortable, riding boot, placement when seated. I have larger feet (US 12.5) and the taper lets you hang your boot down a bit in the front and not contact the shifter or brake lever. Plenty of traction, yet does not interfere with intended boot movement, and lots of surface area resulting in comfort. Have not had a chance to use the bottle opener yet. Easy install. Great fit and finish. Now it feels like a real adventure bike. 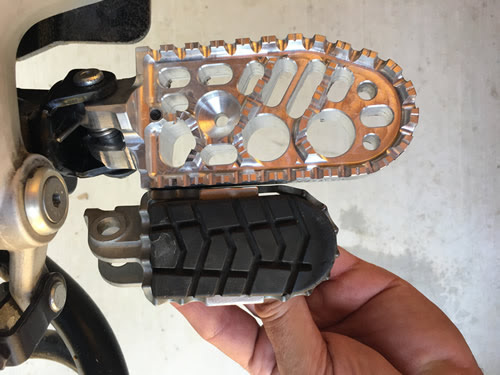 From reading about the product online , I couldn't quite visualize the difference between the stock footpegs and the BDCW with Traction Option footpegs. But wow once I received them and then installed them it makes a huge difference both cosmetically and riding the bike , feels way more confident under foot and the traction screws you have to install during the installation - so glad I did they keep your foot solid where you put it. I would for sure buy them again , the install was straightforward once I figured out how to compress / align the spring with the included dowel - note instructions don't tell you how to use this piece it just mentions it but once undestood on how it lines up the spring / footpeg / chassis hold then easy breezy. Beautiful addition to the bike.